This is one loud and proud hot hatch. AS SOON AS you sit into the Honda Civic Type R it feels very sporty. The driving position is low, the metal gear lever high and the sports seats hug you in the right places. It is a very comfortable and natural feeling set up. It makes a very nice change from the high riding positions of the cars I have recently being testing. In front of the driver is a pleasant enough dashboard set up with a smattering of ersatz carbon trim and red accents. The space inside is good, with decent legroom in the back, a large enough boot – 420 litres rear seats up and 1,209 litres rear seats down. As for the exterior, well I love bold designs and the Honda Civic Type R isn’t exactly shy and retiring, is it? If you want a discreet hot hatch, get a Golf R. But everything you see on the Type R is there for a reason: aerodynamic downforce. That huge rear spoiler will help rear grip levels when you are punching it through the air at speeds up to 272km/h. If you can find somewhere to legally do that. The performance of the Type R is achieved from the 2.0-litre turbocharged four-cylinder petrol engine that makes 320hp at 6,500rpm and 400Nm at 2,500-4,500rpm. Even though the engine is now turbocharged it still retains that hard-edged tone that was so familiar with the previous naturally aspirated engines. Its triple-exit exhaust sounds good, though it isn’t unsociably loud in day-to-day driving. The engine is paired with a six-speed manual gearbox which features Honda’s first application of automatic rev-matching for downshifts in a production car. The gearbox is one of the best I’ve come across. It feels precise and each gear change moves with mechanical eagerness. It feels so good and I found myself looking forward to each shift. Whilst the car is front-wheel drive grip is great, vice-like even. The car loves being pushed hard and you can do so confidently too. Even though the car is pretty wide it is still very agile out on the road. It takes corners neatly and pulls out of them with a confidence that belies its juvenile looks. My only gripe is that those thin sidewalls on the tyres and lack of thick sound deadening material contribute to raucous road noise inside the cabin. The chassis is much improved over the last version. My bones didn’t shake rattle and roll this time round. It is still a bit too harsh in R+ mode but stick it in Comfort mode and it is a perfectly compliant daily driver. The steering wheel weighting is actually lovely in Comfort mode, a little too heavy in Sport mode but as you can’t mix and match the setup, I just kept the car in Sport mode most of the time as I enjoyed the tauter suspension. However, whatever mode you keep it in the steering is accurate and allows you to place the car on the road with precision. When driving the Civic Type R you really feel like Honda has made something a bit special. While its looks will divide opinion one thing that can’t be fault is how the car handles. It can be used as a daily driver, a track-day beast or somewhere between the two. It is fun, fast and family-friendly and frankly, I think it is fabulous. Email “Review: The Honda Civic Type R looks like a bad boy... but it's oh so good”. 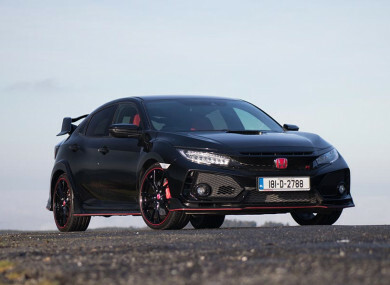 Feedback on “Review: The Honda Civic Type R looks like a bad boy... but it's oh so good”.